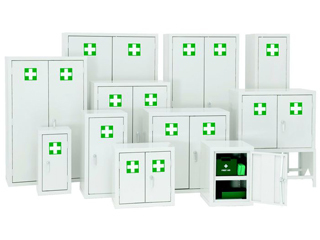 High visibility first aid cabinets of welded construction from 0.9mm thick steel with adjustable shelves. Reinforced rebated doors secured by 3 way locking chrome handle. Finished powder coated white and supplied with first aid labels.